I adore that room. It looks like a magazine. And I must say I envy the gorgeous vintage trim work. Great job! Thanks Jenn! The trim work is what sold us on this house! Love old trim, so much character. What a fantastic job....I love that it is neutral but yet still has a fun vintage feel to it. Great think on the bed base and headboard....I love repurposing wood. Man, everything you do is so stinkin cool! I love that bed- great for a boy's room! Just pinned this one! wow, what an amazing make over. I sure would like to know what you do with all the toys and stuff that kids collect? Do you have a play room? I LOVE the headboard and your map idea is so clever!! Wow what a cool room! You did an amazing job. Love that headboard; would it work with non vintage yard sticks maybe that are stained? And can I ask what etsy seller you found the map? Besides being a fantastic carpenter, painter, you've got a great eye for color, composition, and details. And add great photographer. I admire your energy and gumption to tackle just about any project. I enjoy your site and following you on Facebook. I don't know if you know it, but you inspire many, many women, of all ages, to try their hands at creating, me included. Your tutorials and pictures are always so clear and concise. Can't wait to see what you do next. Thank you for sharing your talents. Thanks for stopping by, Bobi! Really nice job - you should be very proud of yourself Diana! Love that headboard!! Your son's room is adorable! That looks great, another ace job!! I've thought about doing something similar with the map idea. The only real difference I had was to use one of those retractable, spring loaded window blinds. Entend it entirely,clamp it down with clamps or binder clips, glue the map to the underside, let dry and hang in the same manner you showed. I may have to "borrow" the vintage ruler idea, I picked up a few dozen and I really like the look. We're about to redo a guest bedroom and I think this may be the new headboard! You amaze me! God has blessed you with a wonderful talent! 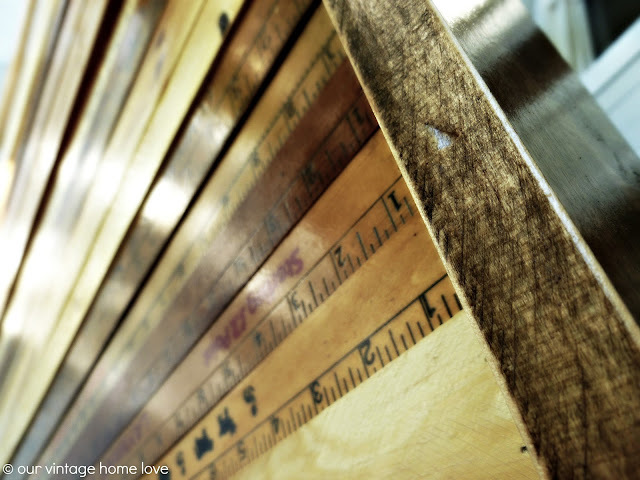 I've been saving yardsticks with the thought of making a headboard ... I don't have nearly enough. This idea to use lattice strips mixed in is perfect! Love it, pinning it! Great map too - I was lucky enough to score a couple of old school pull down maps for $30 each! I love your version! What do I think?! I think you are unbelievably talented...I honestly could not make anything like you did as I am not very handy or crafty. I *adore* that headboard - so cool! that headboard is AWESOME!!!! what a great idea! and of course i love the map, too. The room looks amazing! I especially love the map, ...and the headboard..., and the bed... OK all of it! We are part-way through doing our boys room and this has given me the kick I need to finish it. WOW! Nice job mom. Its a room that says boy, but is ageless...a space he can grow up in. Awesome. The vintage yard stick head board is brilliant. I love the vintage yardstick headboard! Brillant! This looks great! Wish I could get my hands on some yardsticks! That is the coolest boys room I have ever seen.You always have amazing ideas. Your DIY skills amaze me!! What a great room! Adorable! Love the bed...what a great idea! and you can't go wrong with ticking stripe fabric! Thanks for all your posts, and pics, you truly inspire me and I do hope you carry on. I love your boys room redo and may have to refer to your tutorial on the bed as I too have a very active young boy who may have, in the past, ruined a bed or two from goofing around. That bed looks mighty sturdy, luv it and the headboard, my new mission is to search out some old yard sticks. Keep up all your hard work and inspiring posts, they keep me smiling. Hello! 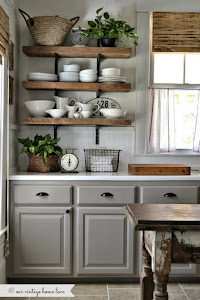 your blog is wonderful and I absolutely love your house! WHERE did you find the TOYS sign?! I have been searching for that for months to no avail. It just so happens to be our last name, and we NEED it for our playroom! I'm sure your son will love this new look room. I really love this one Diana! I wish I had seen this idea before purchasing our boy's store-bought (lame) bed. LOL Way to go! WOW..Can you move in with me? What color is your kitchen painted? You are such an inspiration! Thanks so much for all the pictures of your home. Truly Gorgeous! love your bed of yardsticks and id love to feature it if that would be ok with you please let me know. going to look around some more, also loving your pvc curtain rods! Yes, of course it's okay! Thank you, Lauren! That map is awesome! I have been holding on to that DIY idea for years now and just bought my map on amazon for a buck! I plan on using my new vintage map pull down for the family's been there pin board, if that makes any sense. Great blog! I absolutely adore the entire room! The headboard is unbelievably beautiful and has such personality. I love the map idea as well. Thank you for sharing your creative thoughts with us!! These sound delightful.The flavors sound wonderful too.I love this! Not fancy, not trendy, just cosy and welcoming. I can totally see myself spending lazy sunday afternoons drinking tea with friends there. Thanks for sharing all this information with us, it is true that kids require some space in their room so that they can play and study without any problem and for this purpose you should get such kind of beds which don't take up a lot of space. WOW - really creative and thank you for sharing. We thought it would be fun to also share with you a few special pieces from our collection of authentic original pull down maps. Keep up with the great work, I love your blog!